Montessori classrooms provide a prepared environment where children are free to respond to their natural drive to work and learn. The teacher designs the structure in the classroom using Montessori materials, and individualizes the curriculum for each child. The goal is to teach the child how to learn for themselves. It succeeds because it draws its principles from the natural development of the child. Elementary students, with their increased ability to focus for longer periods of time, will make the transition from concrete to abstract thought. The role of a Montessori teacher is one of guide and observer, whose ultimate goal is to intervene less as the child develops. The teacher builds an atmosphere of calm, order, and joy in the classroom and encourages the children in all their efforts, thus promoting self-confidence and discipline. With the younger students at each level, the teacher is more active, demonstrating the use of materials and presenting activities based on an assessment of the child’s needs. Knowing when to observe and when to intervene is a skill the Montessori teacher develops during a rigorous, specialized course of training. Assessment of a student’s progress is ongoing in the Montessori classroom. Each teacher is a trained observer and accountability comes from being in touch with individual students every day. In the Lower Elementary classroom, daily assignments are given. In the Upper Elementary classroom, assignments are given on a weekly basis, placing more responsibility on the student to complete the assigned tasks and become a partner in their education. Montessori flow charts help track a student’s growth. The design of the Montessori materials provides a path of progress over the years. If a student is not progressing through the materials, this provides a “red flag” for the teacher to change the way in which a concept is introduced. Conferences with parents take place twice each year, providing the teacher an opportunity to present an overview of the student’s progress. The children’s inherent love of learning is encouraged by giving them opportunities to engage in spontaneous, meaningful activities under the guidance of a Montessori trained teacher. Through their work, children develop concentration, motivation, persistence, and discipline. Within this framework of order, children progress at their own pace and rhythm, according to their individual capabilities. The use of Montessori materials are relied upon in the Lower Elementary classroom to help students gain a concrete understanding of concepts. Examples of the materials include math manipulatives such as the Golden Beads which are used to introduce basic math operations where the bead frame provides a concrete representation of one-to-one correlation. In language arts, grammar symbols along with language boxes introduce the parts of speech. The more experienced children share what they have learned with those new to the group. Each child’s unique personality is encouraged; each child is respected as an important member of a community. Mathematics, language, and cultural studies (e.g. science, geography, social studies) comprise the curriculum core. Art, music, garden, Spanish, and physical education are also taught at this level. The following is a sample of a “typical” day in the lower elementary classroom. Morning: The children enter the room, look at the list of activities on the board assigned for the day, retrieve the appropriate materials from their personal cubbies and get ready to work. The children work on academic exercises with flexibility to choose the order in which to accomplish the assigned tasks. Depending on the day of the week, the mornings also include 45-minute breaks for specialists (Sign Language, Drama, P.E., Art, Spanish, Garden, and Music). The children work through the morning with the goal of completing all their daily assignments. by the teacher - include reading comprehension, language (parts of speech or mechanics), math (basic operations, facts, counting, fractions, and geometry), creative writing (paragraphs, poetry, and journal), insets, and finally, geography or science. Afternoon: The work period after lunch is spent reading aloud from a chapter book or presentation of group lessons or a combination of both. The children are encouraged to work independently, to set their own pace, and make positive realistic choices all day long. The Montessori Upper Elementary curriculum provides a non-competitive, intellectually and developmentally appropriate learning opportunity. Children are valued for their individuality and special gifts and talents. Through a culturally enriched curriculum, children take responsibility for exploring the universe and researching those areas of particular interest to them. The emphasis is on learning, not memorization. Upper Elementary students extend skills that have been introduced in earlier years such as prolonged concentration, independent work, participating in the classroom community, and higher level thinking. Self-esteem is a primary concern and teachers are trained to teach respect and positive values. The Upper Elementary classroom provides a bridge for students to move towards more abstract forms of learning. The use of Montessori materials continues to provide a concrete representation of concepts, but in a more complex manner. For example, the checkerboard used to teach multiplication is arranged with relative numbers, not absolute. In language arts, students use manipulative mats to diagram sentences which provides a visual representation of what they will eventually do with just pen and paper. We emphasize reading, creative writing, geography, history, biology, language, mathematics (including algebra and geometry), science, garden, music and art. The program also includes physical education, computer technology, foreign language, practical life, and social skills, and community service. The entire curriculum is integrated, meaning that all subjects are viewed as related. 9:00: Group – the day begins with three centering exercises to refocus the students and to help them calm themselves after P.E. During this time we'll also discuss any changes to the weekly work plans or the workday. Large Group Lessons are lessons that address either the entire population of the classroom or a large portion of them. They are broad in subject and generally cover areas like creative writing, geography, history, or the cosmic lessons. Small Group Lessons are age and interest based. This is when much of the language, geometry and math is introduced. Individual work is chosen by the students based on their weekly work plan, but also with guidance from the teacher and assistant. It is through the individual work that the students master the concepts that they are introduced to in their lessons. During these times, the teacher and assistant circulate among the students, offering help where they can, but also encouraging students to work independently. 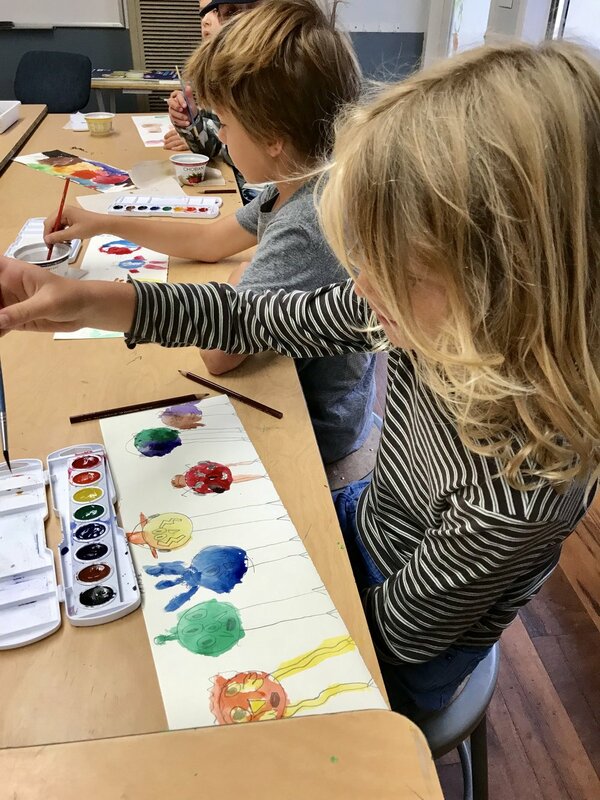 1:30-2:15: Half Group Art/Afternoon Work Period and Clean Up – Sometimes this Afternoon Work Period is a lesson or an activity.